Maintenance: This rink is made of large synthetic tiles so it doesn't need to be resurfaced to get the ice smooth. 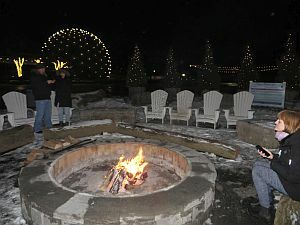 Bonfire: Friday 6pm – 11pm, Saturday & Holiday Weekdays 6pm – 11pm Sunday 4pm – 8pm, Christmas Eve 12pm – 4pm. Christmas Day Closed. New Years Eve & New Years Day 12pm – 4pm. Family Day Monday 12pm – 4pm. 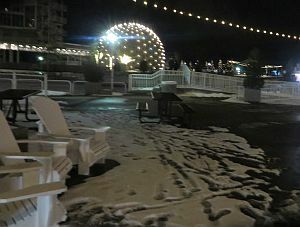 At 6 p.m. there were a few skaters, three people at the fire pit, and at least 6 courteous staff -- but not many visitors for them to help. 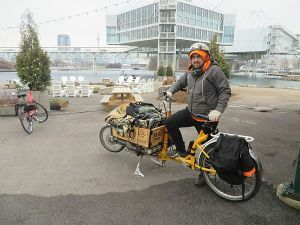 The4 staff said there would most likely be more people later in the evening, and that weekends are busier, especially Saturday evenings. There are beautiful light displays to see, and snacks, and lots of places to sit. But some skaters were complaining that the synthetic ice is clunky and doesn't allow gliding. 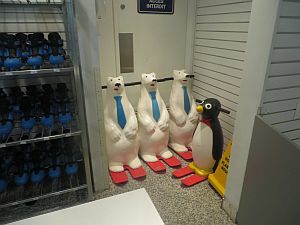 We asked if an Ontario Place management staff person would meet us there, for a little walk-about, but she said that wouldn't work, and if we email her our questions, she could answer them that way. So we'll try that. 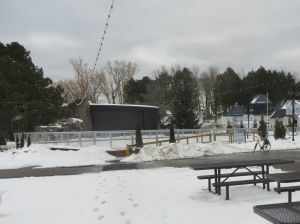 12 noon: there's not a soul at the winter village in Ontario Place. The main paths are cleared but because of the warmer temperatures there's a bit of melt-water coming off the big snow piles, freezing into black ice over the asphalt -- a bit treacherous. All the buildings are locked up. Then three people pass by on one side. 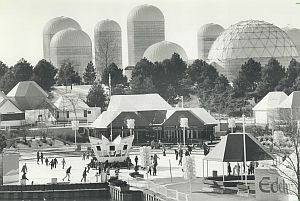 One works for Ontario Place. He says two wild-life workers have just released an injured -- now healed -- duck back into the water where they rescued it. 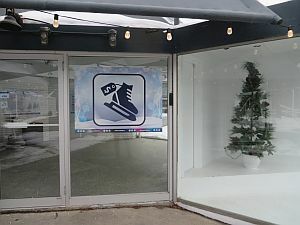 The staff person says that the rink doesn't really open until the afternoon. He agrees that the lack of public transport to Ontario Place is a problem. 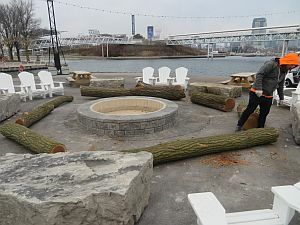 They haven't been lucky with the extreme-cold weather either, but he says that even during the cold weeks, people still came, and warmed themselves at the bonfire on the weekend. I'm a senior with arthritis and I can't walk the distance from the bus stop to winter village. Is there a way to be driven close to where the bonfire is? Unfortunately the closest TTC stop is about a 10 – 15 mins from Ontario Place and we don’t have the resources to offer any type of shuttle service. If you need access to a wheelchair once you arrive, you can sign one out at the concessions building. Please note ID will be required. Please also note that this is an outdoor event and weather should always be a consideration. If there is snowfall, we will do our best to clear the snow as quickly as possible. - my cohort is getting a lot bigger and some of us might like to bring our grandkids to Ontario Place, but the distance from TTC to where things are happening e.g. this winter is a significant barrier. - Is the TTC stop as near as the distance would be if I spent $25 to park the car in a disabled spot? 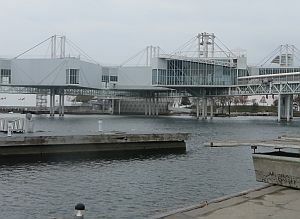 - Would you be able to send me Ontario Place's Accessibility policies? - Has your management considered an as-needed shuttle of the kind the airport staff drive inside the airport? Your on-site staff seem to drive a similar kind of vehicle. I appreciate any additional information you can give me, based on these questions. 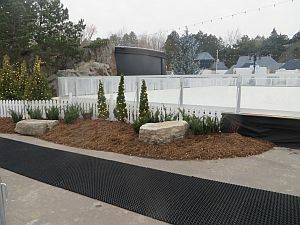 We are currently in the process of reviewing Ontario Place accessibility policies as it is important to us to continue to work on making the space accessible to all. 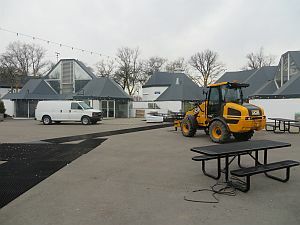 As you probably are aware, Ontario Place was partially closed for 5 years until this past May so our resources are still fairly limited but will hopefully continue to grow as the continued revitalization plans progress. The closest TTC stops are at Exhibition Place, so unfortunately not even on our property. 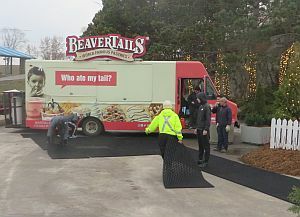 I can confirm that we do have 26 accessible parking spots in our lots, you can find the location of these spots on our website: www.ontarioplace.com/parking. 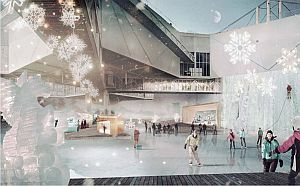 The 2 West Entrance spaces are the closest to the entrance for the winter activities. Parking is a rate of $3/half hour up to a maximum of $15. As we work through accessibility improvements, we will certainly take customer feedback, such as yours, into consideration. 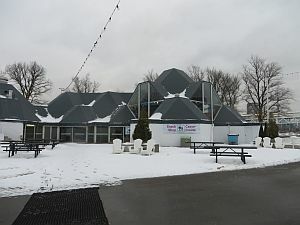 News release about "Winter at Ontario Place" here. Lots of activity because there's going to be an opening ceremony with the minister present. Vendors are getting $1000 for 5 hours serving at the event. It's impressive to see how a fantasy landscape is put together in a hurry. last-minute plastic ice maintenance, with a heater? Summertime, it was a roller rink. 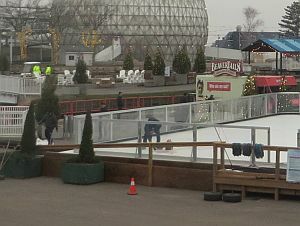 The new plastic rink seems to be almost ready, at the Waterfall Stage. 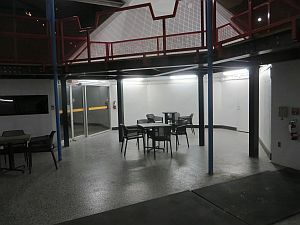 Some workers at the site said they think it will open on Dec.1 -- not sure about that. They said there will be skate lending and skate sharpening in the adjacent building. Maybe food too, and music? Could be fun. 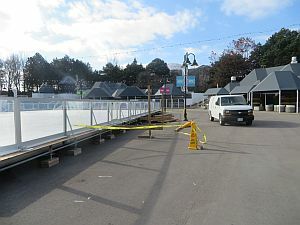 It's a mystery: the Ontario Ministry of Tourism, Culture and Sport sent out a press release on Nov.2, saying that their winter programming will include "skating on a synthetic ice rink and other activities." 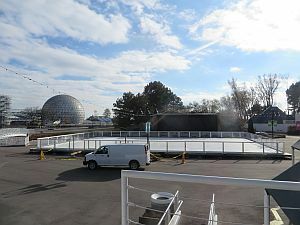 But there's no evidence of any such rink on the grounds of Ontario Place, nor is there more information available through the Ontario Place media office. Where will it be? When will it open? 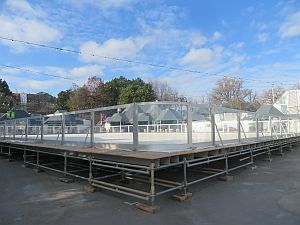 BlogTo ran a piece on the rink, but they seem to be mostly guessing too. 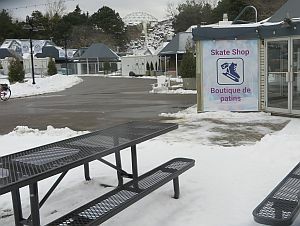 The picture they got from the province is pretty, but so far it's only a picture -- can't skate on that. Here's wikipedia on synthetic ice rinks.